Since 2005 the television program Supernatural has brought together millions of fans that span the globe. We all come from different cultures and backgrounds. We speak many languages and seem to be different ages. Yet this one program has brought us all together, and it is truly a one of a kind fandom, so much so that we use the word family to describe ourselves. This little show brought us all together not just because we liked it, no, it has a much deeper meaning than that. For us the show is more than the monsters, it’s about the journey these characters are on that somehow relate to us on a level that reminds us we are not alone. This show is about brotherhood, hope, faith, grief, sacrifice, love, and bravery. But the most important thing that this show has taught us is that family doesn’t end with blood. This group started as #WeAreSPNFamily and a simple idea that mainly focused on Jared Padalecki, Jensen Ackles, and Misha Collins. In March 2016 our family was going thru a rough patch. Too much hate and not enough love, so a video was created. 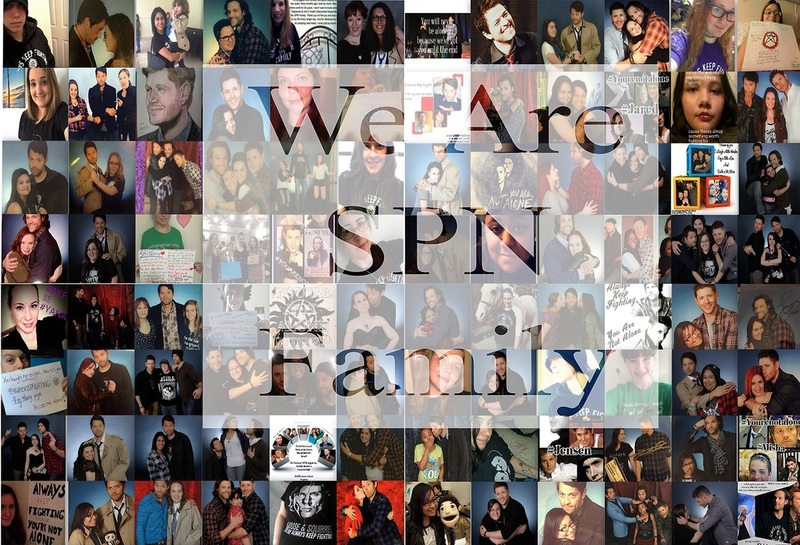 With the help of 50 Supernatural family members who sent in photos to show how much Jared, Jensen, and Misha had helped them and another 30 Supernatural family members who let their convention videos be used, the video We Are SPN Family was born. This video was not to just show appreciation towards Jared, Jensen, and Misha, but it was to show love. The love they give to us, to each other, and finally the love we give back to them. The video was supposed to be the end result, but it ignited a spark in the family. People saw the video as inspiring and motivating. It gave them hope in the SPN family again. So this group was born with the sole mission to spread positivity throughout the SPN Family. We build each other up, swap stories about cons, and share funny stories. But we also jump when someone says they need help; we intervene when someone needs a shoulder to cry on, we stand up for each other, and we have saved lives. We do all this even though most of us have never met or even have had a conversation because we are family and family sticks together. We have decided to take this kindness and go even a step further by creating this website and raising money for Jared, Jensen, and Misha’s charities. We have a slogan that comes from the heart, “Kindness begins with me”. We are raising money for Always Keep Fighting because it hits close to home not only for Jared but for the SPN family too. Random Acts, which is Misha’s organization, has the belief that you can conquer the world one act of kindness at a time, and we believe that’s true. The last charity is the Down Syndrome Guild of Dallas for Jensen. Jensen is involved with this charity, and it hits close to home for him as well, and we want him to know how much we care.